Title: Rock Stars Stole My Life! In a sodden tent at a ’70s festival, the teenage Mark Ellen had a dream. He dreamt that music was a rich meadow of possibility, a liberating leap to a sparkling future, an industry of human happiness – and he wanted to be part of it. Thus began his 50-year love affair with rock and roll. From his time at the NME and Smash Hits to Radio One, Old Grey Whistle Test, Live Aid, Q, Select, Mojo and The Word magazines, he’s been at the molten core of its evolution, and watched its key figures from a unique perspective. This funny and touching personal memoir maps out his eventful journey. It tells stories and settles scores. It charts the peaks and disappointments. It flags up surprising heroes and barbecues the dull and self-deluded. It puts a chaotic world to rights and pours petrol on the embers of a glorious industry now in spiralling decline. 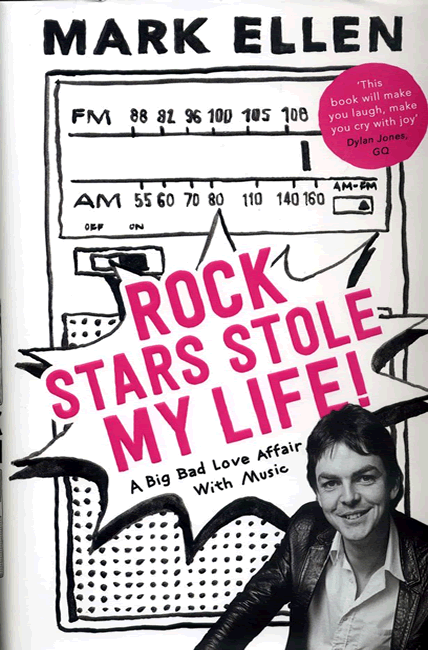 Ellen has been at the coalface of rock hackdom for 40 years, yet unlike many of his contemporaries, he has always viewed his relationship with the music industry – and the preposterous entertainers it throws up – as a ridiculous pleasure rather than a burden. Ellen is not only one of the nicest men in the industry, he’s also one of its funniest writers, and this books picks away at the hand that has fed him for all these years with such humour, and such delicacy, that it becomes impossible to put down. Here is a man who presented Live Aid, who presided over the most popular music magazine in the world, and who unwittingly became one of the last people to interview Michael Jackson in print. And it is never less than hilarious. This book will make you laugh, make you cry with joy, and send you scuttling over to what is left of your record collection to look for an Elvis Costello album you probably have not played since it was released. Full of engaging asides and deft, sometimes unsparing pen-portraits, this autobiographical souffle ends with three passages of unexpectedly disturbing power, in which Ellen glimpses the fate of a form of entertainment that has lost the sense of purpose and proportion it possessed during the years when his own tastes were being formed… It is a tribute to Ellen’s resilience that not even this sensory assault can erode the powers of humour and observation that make his book so enjoyable. The book has two picture sections featuring a selection of photographs from Mark’s personal life and career.